The secret to getting a good night’s rest would be having a comfortable bed, as well as being in the right temperature, with a nice pillow and bolster for others. Of course, it also helps if everything around you was deathly quiet, and for some of us, we would need to have a decent soothing soundtrack playing in the background. With the $69.95 Sleep Sound Generating Pillow, you can be ushered into dreamland faster than you can count up to 100 sheep. 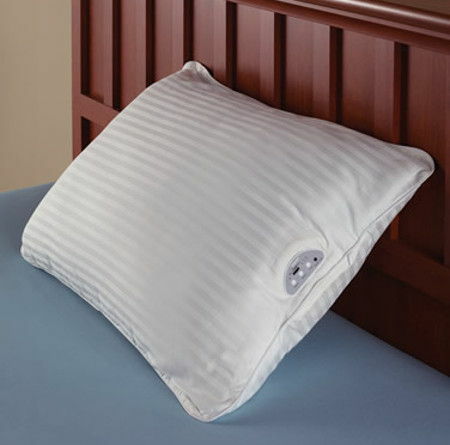 The Sleep Sound Generating Pillow happens to be a cordless plush pillow which will play back white noise as well as nine relaxing nature sounds so that you will be able to sleep faster than you have ever done before. Instead of having to deal with the nasty tangles of a headphone cord, there will be well hidden speakers in the pillow which will be able to deliver clear audio without bulky components. Apart from that, it also helps keep the sound close to your ear, resulting in a lower level of play volume compared to speakers so that others in the same room as you, too, will be able to sleep.